There has been a dramatic spread of health markets in much of Asia and Africa over the past couple of decades. This has substantially increased the availability of health-related goods and services in all but the most remote localities, but it has created problems with safety, efficiency and cost. The effort to bring order to these chaotic markets is almost certain to become one of the greatest challenges in global health. This book documents the problems associated with unregulated health markets and presents innovative approaches that have emerged to address them. It outlines a framework that researchers, policy makers and social entrepreneurs can use to analyse health market systems and assess the likely outcome of alternative interventions. 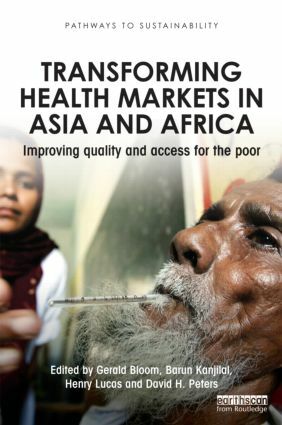 The book presents a new way of understanding highly marketised health systems, applies this understanding to an analysis of health markets in countries across Asia and Africa and identifies some of the major new developments for making these markets perform better in meeting the needs of the poor. It argues that it is time to move beyond ideological debates about the roles of public and private sectors in an ideal health system and focus more on understanding the operation of these markets and developing practical strategies for improving their performance. This book is ideal reading for researchers and students in public health, development studies, public policy and administration, health economics, medical anthropology, and science and technology studies. It is also a valuable resource for policy makers, social entrepreneurs, and planners and managers in public and private sector health systems, including pharmaceutical companies, aid agencies, NGOs and international organisations.